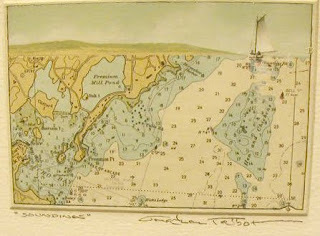 Last week some of us on the North Shore of Massachusetts were treated to a visit from collage artist Jonathan Talbot. I have always wanted to take one of his workshops in Warwick, NY, so I was thrilled to hear he would be in Lynnfield (5 minutes from my house!). 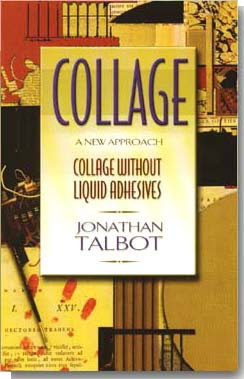 I have lots of books about collage, including Talbot's Collage: A New Approach, which describes his technique of collage without liquid adhesives. Although I've practiced the lessons in the book, it's always helpful to see first-hand how things are done, and his demonstration was wonderful. In addition to the demo, and showing us two of his thousands of completed collages, Talbot regaled us with stories of his early days, his thought process and inspiration, and his reasons for making art, prompting discussion regarding our own artistic endeavors. It was a two-hour tease into an ocean of knowledge that he is willing to share...so I guess it's time to save up for one of his workshops!